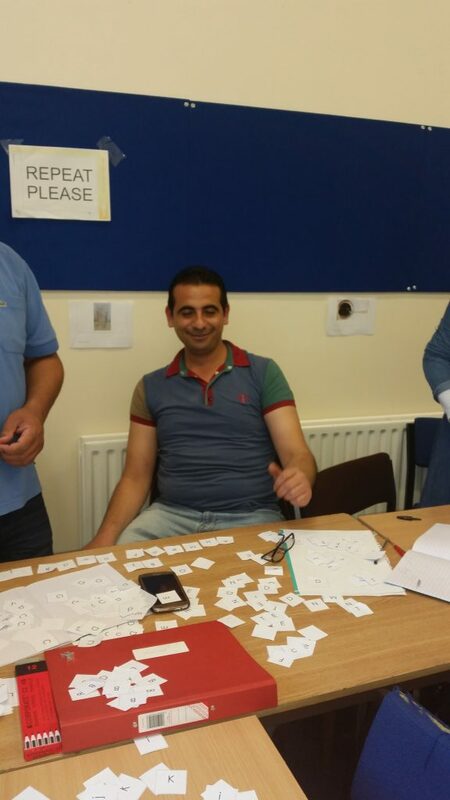 The ESOL Project aims to provide a structured approach towards providing English classes, particularly during our clients’ first 6 months in the UK. To date we have provided over 3000 hours of ESOL at NNRF, which includes 600 hours of 1 to 1 language support. We have developed a unique assessment system, which identifies a learner’s language level. Assessment appointments are offered daily as part of our general Advice system.. There is a new intake of students every 12 weeks. We offer a range of classes from Pre Entry Level, to Level 1. These run daily from Monday to Saturday. Classes are varied and the timetables are reviewed each quarter. Our ESOL sessions have included General English, Basic Literacy, Women’s groups, Conversation & Discussion, Reading & Writing Booster, Youth ESOL, Anti-Destitution sessions, Nottingham Orientation, Summer Short Course and Summer Short Course booster sessions. We also deliver ESOL as part of the Vulnerable Persons Resettlement Project which follows a course that has been approved by the Home Office. We also support Opportunity & Change, Employability and Children & Family projects by providing embedded ESOL workshops. We are fortunate to have a pool of diverse, experienced and committed ESOL Tutors and Classroom Support Assistants. Training for tutors includes an Introduction to TEFL, Working with Asylum Seekers and Refugees and Assessing ESOL Learners. We also support tutors to attend a bi-annual ESOL conference.